Google+ isn’t only a social network. It’s the very backbone (and future) of Google itself. As Brian Clark wrote yesterday, authorship and the possible effects on the Google algorithm have the potential to be extremely beneficial to savvy content creators. If you’re a writer, this is either going to be very good for your career, or you’ll risk becoming relatively invisible online. If you’d like to land solidly in the former camp of writers, the question becomes one of how to use Google+ to further your own goals. With that in mind, I’ve put together an infographic for you that outlines 64 strategies that every writer and content producer can put into action, and start reaping the rewards of intelligently engaging with Google+. The first step in getting results from Google+ is connecting your profile with your blog’s home page. This is the gateway step to claiming your content in the eyes of Google. It will also go far in generating incredible results, including displaying your photo next to your blog post links and a wikipedia-style profile listing in Google search results whenever anyone searches for your name. Of course, for WordPress publishers, there’s a very easy way to accomplish this. Circles allow you to organize connections into the groups you interact with in your life. Family, Friends, B2B, B2C, Local, Media, Influencers, Quilting (my hobby, about which I wrote an award-winning book). Not only can you view posts by Circles, you can send posts to Circles, yet another Google+ first. Circle’s biggest benefit? People who add you to their Circles see your posts higher in Google search results. Another SEO boost. Hangouts not only up your level of branding by enabling you to host webinars for free, if you do a Hangout on Air, Google+ simultaneously streams it here and on YouTube, records the video, and sends you the recording via email. Upload that Hangout to YouTube, add the link to your blog with a reader-friendly keyword-rich description, and you’ve got a powerful SEO tool that doubles as a branding resource, allowing people to see you in action. Just like Twitter, Google+ offers a hashtag ecosystem that makes searching for topics simple. It’s a great way to get found — not only inside Google+, but in the larger world of Google search. Combine your Circles strategy with hashtags, and you’ve gone a long way toward placing your blog’s SEO on steroids. Whenever you have a new blog post, link to it from Google+, and make that post public. By doing this, you’ve made your post publicly available both inside Google+ and in Google search results worldwide. Remember those people in your Circles? When they’re searching for your subject on Google, they’ll be served up your results first. Ripples are a little-known feature of Google+ that identify people who shared a public post, as well as how large an audience they have. It’s a great way of determining who has the power to spread your posts to the widest possible audience. You’ll definitely see a trend when you start using Ripples and you’ll notice those outliers who have the power to get your posts seen by a huge audience. Add these people to your Circles and engage with them. Google+ posts that receive the most comments are resource-type articles with a lot of links. Those covering Google+ how-to information are heavily shared, along with any tutorials. Write a killer post and link back to your own blog for additional resources. Use hashtags with relevant topics so it’s easily found, and you’ve created an outstanding resource that will get you noticed, and will increase traffic to your blog. The most powerful feature of Google+ is Direct Connect — think the Facebook Like Box, available in Google Search. By placing code between the <head> tags on your blog, people will be able to add you to their Google+ Circles directly from Google search results. Currently, Direct Connect is available on a limited basis, and appears to be offered to those pages with a large Google+ following. To be eligible for Direct Connect, you must have that link between Google+ and your blog’s home page I referred to in tip #1. Like Facebook, Google+ offers the ability to tag people and brands in your posts. This is a great way to connect with people and draw their attention to your latest resources, especially in a noisy digital culture. As an example, I attended a public relations conference and tagged the people I met at the event in my Google+ post about it. Getting your photo displayed next to your Google search results used to be extremely difficult to do. No longer. All you need is a Google+ page, and to connect it to the home page of your blog. See how important that #1 step was? Again, here’s a shortcut to getting it done. Your photo will eventually appear next to your blog posts in Google search results. I’ve made sure my photo stands out by going beyond just a black and white headshot. I’m wearing vibrant colors, which stands out against the sparse Google white background. Take the time to learn Google+ and engage with your community here. You’ll see results far beyond what any other social network can offer: both social engagement within Google+, and SEO in Google. Maria Peagler is founder of SocialMediaOnlineClasses.com and an award-winning publisher and author. Get more from Maria on Google+. Thanks for the great strategies on how to get started! I didn’t know about Ripple… interesting. Ripple walks softly and carries a big stick. I love it. Let me know how you use the checklist Joseph. Glad you enjoyed the infographic! I’m still not sure how the general masses at large will look at Google+ in the long run, but Google is doing everything they can to get businesses and professionals active and involved on the network. The way I feel about it is that anything that Google puts out, especially something this big, is probably being taken pretty serious by the people at Google so it’s worth investing in just to make sure all your bases are covered. You can ramp up or down as needed. Nick – time is the great equalizer. Google+ has gotten off to a slow start, but I predict it will blow Facebook away in 5 years. Those who are on Google+ early will gain the most. I think that’s a very smart approach, Nick. I think Google+ is going to be huge this year. Especially with Facebook’s announcement last month! Both are doing everything they can to make business “have” to have accounts with them. At first, i was not really a fan but now with the authorship function I can see great benefits. My plan is most definitely to use it more this year. It has been a strange month of activity on my Google+ account with new members added me every day now – I think a lot of people are starting to realise the potential it has. Great post and Infographic – will share! Google+ is subtle like Google search: clean & useful. It doesn’t push itself on you, so it’s taking a while for content marketers to realize how essential it is. Awesome content Maria, you’re so right about Google+ not being intrusive. Google+ is definitely going to be a game changer for people who take advantage of it’s benefits. Could not agree more on Google+. Google is always looking to improve their social search and Google+ will be integrated heavily in the future. Thank you for a great and very clear explanation of how Google+ works and why it is so important. I am guessing that Facebook is going to turn more and more toward lots of lightweight social interactions between individuals funded by big brands with deep pockets. It looks that way to me now. It would be great to have a real alternative that worked and brought real benefits to using social media in a way that did not take an enormous investment in time and resources. I’ve created both a personal and business page on google+, but honestly my confusion is which one I should be linking to, posting on, etc. Any tips? Hey, how did you create a business page on Google +? Can’t seem to be able to do it as the system does not recognize my business name, it wants the name of a real person. When you are in your profile, in the menu options down the left side there is one called “pages”. Choose create a new page, and away you go. First off, I wanted to thank you Maria for the great info graphic. I am having the same problem as Heather Jones. Is there an identifier on the page that shows you that you are working with your business google plus page? Excellent tips. Will have to share for #SoMeSa. It’s funny how loyal people are to their social media platform these days. Currently you need G+ for authorship do you think FB will counter with their own version? Facebook doesn’t have a real search engine, no matter how much they want one. Thank you for this informative post on how to use Google+. I’m not sure about tagging people because just like you can tag someone on Facebook, a person may not want to be ‘tagged’ for various reasons. For example, an employee may want to quit her job and start her own business. She may not want to be tagged in a photo because her employer probably doesn’t she’s attending classes, workshops, and seminars. I think tagging can be tricky business for some people. Of course Google plus is growing exponentially.. and Google authorship is an excellent option. BTW I dont know much about social media, but after using Google+ and and G+ authorship I could increase traffic of my blog very fast.. Thanks for excellent info !! I agree with Maria above, I want to keep my personal Google+ very separate from my business Google+. I am still not sure how to author a business blog like, http://www.critigen.com/blog/it-departments-where-did-your-business-focus-go with my name and picture and keep it separate from posting family pictures. This is such a great infographic, and the article also clears up some “blind spots”! Maria, have you tried linking your blog posts to your Google+ account yourself? I understand that it has some advantages but as I understand they have a certain verification period, right? Yes – Sasha – every post I do I link to on Google+. It increases visibility especially for those in your Circles. Google does take some time to verify your post, but they’re a large company and it takes time for them process your requests. But don’t wait on that to start linking to your blog posts. And what is your experience with adding people to Circles? If you want to talk to an expert, for example, is it a good way to get noticed? Thanks for the great tips, Maria. Does a Google+ Business page operate the same way as an individual’s page, and does it have the same SEO results? I oversee content development/strategy for several websites with multiple freelance writers; I was thinking a business page for each site makes sense. Amanda – they differ only in how people can connect to them. If you’re a person, you can add anyone to your Circles. If you’re a brand, you can add someone only if they’ve added you first. It’s a privacy protection. As far as SEO, yes they’re about the same. It all comes down to how many and who are in your Circles. I’ve had a Google+ account for about a year now. I can see the value in using Google+ to market my blog and business. Lots of little niches in Google+. However, it’s taking some getting use to. Do you have an e-book or site where I can read up on Google+. Very valuable marketing source. Thanks, this is a great post and I love the infographic. I did not know about the hashtag ecosystem or the ripple feature. Thank you so much for this. I am fast becoming Google+’s biggest fan. I use hangouts fairly regularly now. This post was really good Maria. Admittedly I did not use Google+ much though I do have an account. Thanks for your steps. You make a great case for folding Google+ into what we are doing online. Wow the power of the web. Its evolution is really very interesting. Thanks again! Great post! I recently read that Google is trying to discourage anonymity. I think Google+ is going to be a big part of that. Great post. Lots of useful information. Please keep them coming. Looks like the jury is in with Google + ..now reportedly the second highest social network, it is a force to be reckoned with. Claiming Authorship is definitely the way to go and it’s great to see everyone jumping on this. In the end the readers benefit by having a recognisable author to relate the content to. While I haven’t done any split testing I can confidently say that more users would open the article/post which contains the Author’s image. I was a naysayer up until a few months ago. The author rank feature won me over. Let’s face it….most of have the main goal to have our site or blog at the top of Google search results. The best way to do that is provided through Google itself. Thanks for the tips. I need to know the relationship between a personal profile & a “business” profile, or page, on Google+. I have a product I need to promote. I prefer to do this from my business page rather than my personal. Will I not be able to experience the same ranking benefits if most of the activity is on my business page? Tiffiny – You can use either page to promote your product. I tend to use my personal page, only because it’s easier to connect with people in Circles. I would focus on whichever page has the largest number of connections. Thanks for this information, and I just love the infographic they tell so much. and your site/blog is a wonderful source of learning for me. I do use Google+ I have for about six months now!! Thanks so much. I also get your newsletter! wonderful, and I am sharing this information on rebelmouse! Smile. Hi, Maria. Though I set up a Google+ page for the first time a few weeks ago, I’d already grown disenchanted with it. Your article completely changed my perspective. I get it now. Thank you. Very informative post, Maria! Haven’t heard of Ripples before, seems to be a very useful tool. Google+ is great social network and SEO booster at the same time, that definitely should not be undervalued. Please ttry to be more specific/accurate when providing “tips”. IF they are logged in, IF they have SPYW enabled in their settings. Further – this may alter over time (both with G tweaking, and in regards to Freshness). Care to share how using #hashtags can affect/influence Organic SERPs? As far as I’m aware, they are Internal to G+ Search. As for usefulness in G+ Search – have you seen how fast the search “stream” tends to move on many topics/terms? You’ll be lucky if your post is visible after 3 minutes for popular subjects, or 30 minutes for moderate subjects. Further, we have no stats/data available on the number of G+ers that actually use the Search function. Again – IF they are logged in to that G+ account, and IF they have SPYW enabled in their settings. That completely depends on definition of Engagement, and your Audience. Plenty of people get engagement of various types posting fluffy cat pictures. Further, stats show that in the main, the majority don’t read long, lengthy posts. They seem to prefer the shorter/medium sized ones. If you want engagement, use Bold on the first line of your post (title), and include an Image with your post. +plus in a few people that you know would be interested or that draw attention/interest. Use proven Titles (question, help, challenge etc.). Those will drive engagement more than a “long post” in many cases. Yes, you can try +plusing people in to the post. Yet if they have not circled you, they may not receive any notification about it (depending on their settings). Worse, you do it to often, or for trivial reasons, and you may get lumped as a “spammer” and get yourself blocked! It does Not gaurantee that your profile pic will show in the SERPs – it just means it may. This is extremely valuable content. I’ve had a lot of success using longer Google+ update posts as a way to generate engagement to my topics and ideas…. A couple long, connected posts with a link back to my website has yielded good search traffic as well great direct traffic and engagement. Great Tips Maria..! 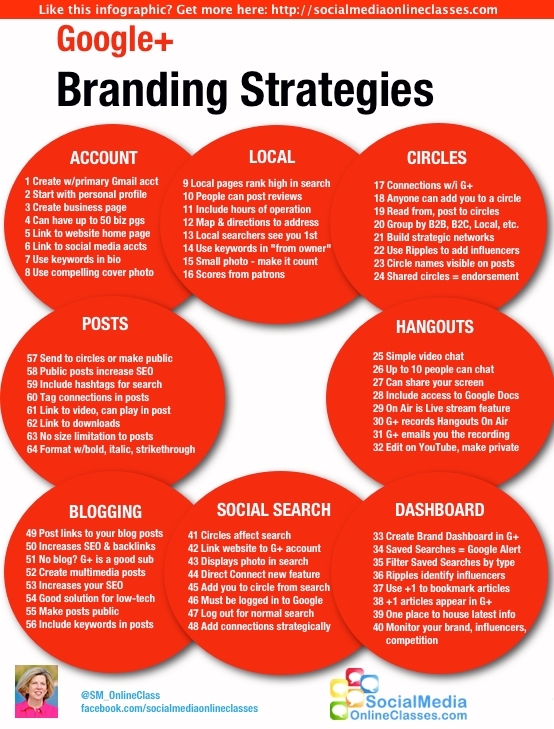 I don’t use Google + much, But after this awesome Info-graphic, I’ll do use Google + at least 20 Ways you mentioned in that Info-Graphic. Keep creating such graphics, They are more inspiring me to read and watch..!!! I really hope this is the year of Google+ as others have said. I’m still getting used to it myself, but I’m growing more and more annoyed with Facebook and would love to be able to scrap it altogether. Someone was asking about an ebook on Google+ in one of the other comments. I remember Guy Kawasaki released a pretty extensive guide not too long ago and made it available for free. I don’t remember what it was called or where to get it, but I’m sure a quick Google search will turn it up. I wish you had spelled out how to create a business page on Google + It is not so obvious for everyone. I struggled with this issue for weeks and have just managed to figure it out today. In fact, I didn’t even know that it was possible to create a page on Google +, thought that I just had to work on creating a profile. Julzwriter – Glad to hear you’ve developed your business page on G+. It will go a long way to helping you get found both inside G+ and on Google. Now start adding people to your Circles: those you know, those you’ve worked with, and those you want to. Can you expand on “1) Link Google+ to your blog” in the context of company blogs and company G+ pages? Great tips. I usually only post links, but will think about posting more and getting people to engage. I believe this is a long learning curve but really profitable. After all, it is about Google Plus. Search engines must love the stuff. Enjoyed the article. What’s your experience with using hashtags as a means to be seen in searching? I feel like there is a lot of noise in the more popular areas and if you arent updating posts every hour or so you will get lost. Does G+ have a way of pinning important posts and topics similar to FBs timeline option? Read all the posts on this and much study of G+ optimization is needed I see. Your thoughts about getting lost in noisy popular areas intrigued me…although as a newbe I know very little about, and I’ve seen very little on G+…and posted very little indeed, I thought from the outset that G+ for me would be about QUALITY, not QUANTITY, so I started with The ECONOMIST. I think my G+ will become more of a library of things I have time to read, related to my business interests I’ve no idea what the popular areas are, I havn’t even looked for the circles I want yet, but anything of the ‘instant trivial noise’ variety will be avoided. Re the dreaded ‘timeline’ you mention, I guess it may do so, but hopefully not in chronological childish diary form like hideous FB, but in content rich ranking, and I guess, now that my G+ cogs are starting to turn…. by how much content rich replies and interaction posts from people with a lot of good sense and/or good writing style generate. OK, maybe I missed something obvious here, but why is the article titled “64 Google+ Content Strategies” when only 10 are listed? There are 10 key points highlighted in the text, but 64 total in the infographic. Nice little infographic to help people do more with Google+. Whatever you do on Google+ will soon be a massive part of how Google lists its results. Personalized search is also going to mean less visibility for your website unless you are connected to people, so now is the time to get ahead of your competitors! I couldn’t agree more with the importance of the the highlighted 10 actions and those listed in the graphic. I recently have been paying much more attention to G+ so this post came along at the perfect time! I’ve been experimenting with the best ways to find cool people to encircle and improve the amount of good content coming through my feed. One of the things I’ve been looking at are some of the large public circles because they allow you to bring in a bunch of people who relate to a topic all at once. I think Google+ is doing exceptionally great. Its absolutely encouraging for bloggers and writers to know that they can write a story or an inspirational post and then have it published worldwide through Google +. That’s absolutely commendable, thanks to Google for this privilege! Great post. There are tons of Google+ communities and every blogger should establish authorship. Google’s author rank has to come into play soon for the serps. This inforgraphic is the most concise and informative information I have found anywhere on the net when it comes to Google +. There is so much garbage and useless information that only touches on one aspect of G+. Now to figure out how to utilize all these aspects! I have been ignoring the Google+ initially, I found facebook much easier and popular, but your this article is quite helpful to know the intensity of Google+. I just created it for my blog’s content to share on it, for better visibility, specially in eyes of Google. Thanks. I have not yet entered the world of Google Plus for my websites and blogs. I was iffy at first because I figured it was just a Facebook clone. However, it seems to be taking off now so I might as well get into it now before it is too late, right?! I plan to use this post and infographic as I journey into it. 🙂 Thanks for providing it!